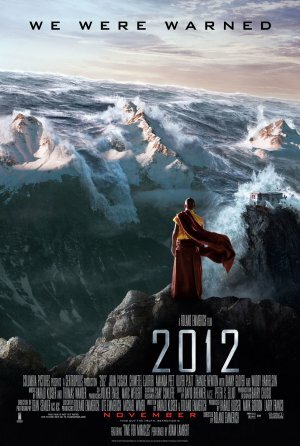 Scientists discover that in 2012 the world was going to end with a massive global shift. When the year comes John Cusack attempts to save his family from the impending doom. There is no honest way to review this film. As a drama the film is laughably bad. Its simply awful and one of the worst in the truly awful pantheon of disaster films. If you've seen films like When Time Ran Out or some of the Japanese doomsday movies from the 1970's you'll have a good idea how bad this all is. Then again I can't see anyone wanting to see this for the sterling dialog. As a showcase for special effects and destruction this film is amazing. If you've ever wanted to see California slide into the ocean here's your chance. Let me be honest the destruction in the film is incredible and way cool and is the reason to see this film. Its just about as far as you can go in showing the world being destroyed and still feel good at the end. Its amazing.